A new study says there are 22% more people with glaucoma in the United States than there were a decade ago. This disease targets your vision, damaging the eye’s optic nerve and slowly progressing to blindness. But here I lay out for you some supplements that might take glaucoma down. Most glaring is a statistic that says 50% of people with glaucoma don’t even know they have it. These stats came out last month from the group Prevent Blindness America, coinciding with National Glaucoma Awareness Month (January). Older adults and those with a genetic link to glaucoma are at highest risk for glaucoma. Treatments are few and far between, and even effective alternative remedies are scarce. But at the same time, a brand new health breakthrough occurred for one herbal cure in particular. And that would be ginkgo biloba. One small study was very promising, as it found that taking 120 milligrams of ginkgo a day for two months winded up significantly improving vision in people with glaucoma. It’s believed that the ancient herb enhances circulation, which leads to improved vision. 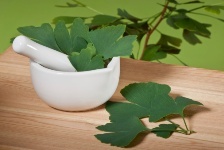 A small double-blind, placebo-controlled trial found that use of ginkgo extract at a dose of 120 mg daily for eight weeks significantly improved vision in people with glaucoma. Some other supplements have some preliminary evidence behind them, though it remains too early to recommend them. They are vitamin C, melatonin, and omega-3 fatty acid, all of which may reduce pressure in the eye that contributes to glaucoma. Some recent evidence points to cod liver oil (rich in omega-3s) as being a potentially great way to reduce risk for glaucoma. Quaranta, L., et al., “Effect of Ginkgo biloba extract on preexisting visual field damage in normal tension glaucoma,” Ophthalmology 2003; 110: 359-362.